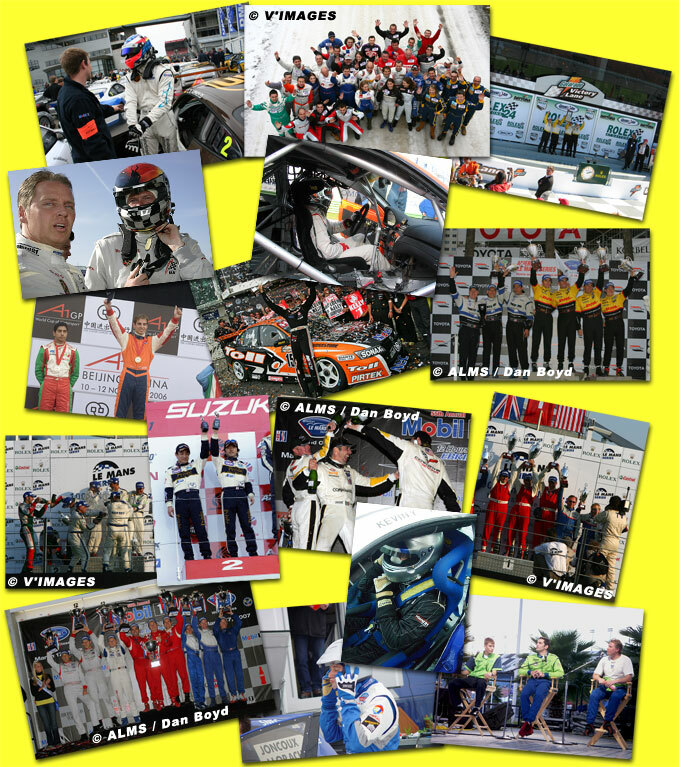 "Made-to-measure and to your colors from head to toe"
"The racing driver is the most important person in the world"
The 2007 season has already started with series such as A1GP, the Dakar rally, WRC, Formula 1, 24H races (Daytona, Dubaï, Bahrain. ), Nascar, GT, ALMS, LMS. The "off-season" doesn't exist anymore for most of motor racing actors. In 2006 Stand 21 and Porsche Motorsport have renewed their collaboration, after having previously created the Porsche Motorsport official racewear collection concept. We are proud that Porsche Motorsport has trusted us and given us a manufacture license for racing divers equipment and its distribution in our exclusive network. By doing so, and in less than 6 months, we have already doubled our initial collection sales target! Regarding safety, 2007 is the result of our daily R&D and medical research. We have decided to launch the Heat Stress Program with motor racing official top-teams (Porsche, Corvette...) in order to guarantee you even more performing homologated products in accordance with the world most demanding standards. We are also glad to witness the continuous growth of the spontaneous use of the HANS® system by racing drivers. By contributing to its installation, we have shown that, well-fitted, it is much safer and yet comfortable for the driver to wear it. With the widest range available on the market (over 14 references including a special model made exclusively for a well-known Formula 1 team), and the precious help of its medical team, Stand 21, one of the three HANS® world manufacturer, can be proud of this year 50 % sales rise in safety products. 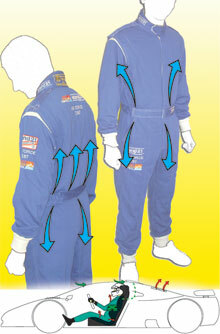 made-to-measure suits made for the 2007 Daytona 24H and over 450 for the 2007 Sebring 12H!). Enjoy the reading and see you soon on the track! The 2007 catalogue is available!!! Check out now all our products and innovations. Moreover, a special catalogue of the exclusive and official Porsche Motorsport racewear collection is attached. Ask for your volume by clicking here. Most of us saw footages of the C5-R Corvette fire breaking in Luc Alphand Aventures team during the Monza LMS practice session. It can take several seconds for a pit crew member, concentrated on his work, to see a near hazard. Well-equipped of fireproof suits (but not FIA 8856-2000 homologated as required), 2 mechanics have been burnt . For years, Stand 21 has tried, as good as possible, to inform teams on standards and safety. We remind you that minimum safety required by ruling bodies in motor racing series can not, in any case, prevent each and every incidents of happening both on track and in the pits. Just a few years back, those mechanics would have been allowed to wear cotton suits and the poor ones would have been much more severely burnt. If a team can not give its mechanics 2 or 3-layer FIA 8856-2000 homologated fireproof suits, as compulsory for refuellers, we advise them, at least to make them wear long FIA 8856-2000 homologated underwear, a (refueller recommended) balaclava, FIA 8856-2000 homologated socks and boots and FIA 86 or FIA 8856-2000 homologated gloves to prevent any serious burns for these dedicated crew members in case of a fire. We also suggest to wear these pieces of equipment in testing sessions as well, where it is easy to care less considering no regulation exist to this day. In spite of that, we would like to wish a speedy recovery to Pierre Challier and Eric Kaiser, the two Luc Alphand Aventures mechanics who have been involved in the fire, and we hope to see them back on track very soon. Today, Porsche has joined us again. "This collaboration is based on our Heat Stress Program, our quality products, our delivery times, our mutual respect and on our world distribution network.". 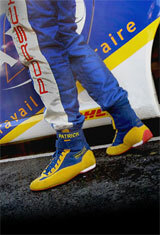 Find out all the Porsche Motorsport Racewear Collection made by Stand 21 !!! Following numerous tests alongside with professional drivers worldwide, we have optimised even more the world most breathable racing suit (and the only 100% stretchable): our ST3000. This racing suit, which has already had the exclusive pairformance® material, stretchable and aerated, and the special active pairspiration® hydrophilic/hydrophobic active treatment, has had its inside layer rethought to offer even more breathability. As all Stand 21 racing suits, it is off course 100 % customizable and available made-to-measure, as well as in 13 new shiny colors now available. Boots customisation, it was your dream. Stand 21 has made it come true! Motor racing world exclusive! Today, you can create your own pair of boots to optimize your comfort and performances and completely match them to your equipment and your team's! Embroider your underwear tops for a better communication! 4 colors are already available: black, blue, red and white. Your underwear tops "with your label" on request! You've expected it. The new helmet is coming!!! Its name: IVOS pour Innovative Vision Optimum Safety. "Specifications were simple: manufacturing the lightest helmet possible around the HANS® system in order to optimize safety even more, our daily goal." From the first sketches to the actual product, two years would have been necessary to create this new helmet which will be the lightest on the market . Revolutionary concept, the Air Force racing suit by Stand 21 is coming soon. Currently being tested, mostly with Team Corvette Racing, this racing suit, FIA homologated and which uses the same patented concept as our F21 - Air Force helmet will improve the driver's cooling even more without using any electronic or mechanical parts with potential failures during a stint. It's the outside air, flowing inside the racing suit trough an exclusive patented system, which improves the driver's comfort by cooling his body temperature and by pushing out the sweat off his skin surface. (a maximum of 70% of leather in the hand palm) is coming soon. Inspired by the Daytona gloves, the outside seams gloves will have a new technology, a new design and optimum comfort. Stand 21 invented the first outside seams gloves in collaboration with Ayrton SENNA back in 1984. Compulsory in the numerous championships, the HANS® system has proved its effectiveness (Demonstration videos on our website). "Essential safety element, many among "gentlemen drivers" have understood the importance of this system. There is a real "awakening" and it is a huge step for safety in motorsports". Jimmy Pichon, Racing Service Department Manager, Stand 21 France. Over 14 sizes and models are available according to your series (GT, single-seater car.). As a matter of fact, we are frequently asked for made-to-measure models such as the 30 Hi-Tec size ML, specially made for a world famous Formula 1 team, which wanted its drivers to obtain the best performance and did not hesitate to pay for this highly specific development. 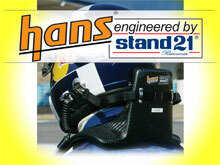 Over 70% of the Formula 1 drivers wear a HANS® engineered by Stand 21. We remind you that a very effective padding air, unanimously recognized by all the drivers who tested it, can be added to ease your HANS® system fitting. 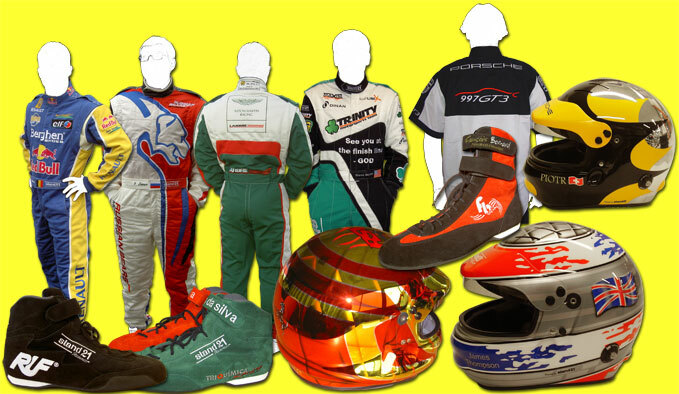 In order to help you in your quest of authenticity, Stand 21 offers you "vintage look" equipment to your car colors using the latest technology... We have recreated a large vintage range (helmets, racing suits, gloves, boots.) to the latest compulsory standards. 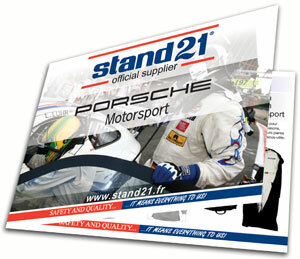 Stand 21 is proud to be the official supplier of legendary races such as Le Tour Auto Lissac and Le Mans Classic. Find all our vintage range here. Stand 21 exclusive distribution network members are trackside for more than 200 races and events worldwide yearly to meet you! The trackside service calendar is available on our website and come and test our products in race conditions! P.O. Box. 282048, Dubai, U.A.E. On Mondays: from 9 a.m. to 12:30 and from 2 p.m. to 6:30 p.m.
On Tuesdays to Fridays: from 9 a.m. to 7:30 p.m.
Do you like this newsletter? Put a friend’s name down to share those information! If you don't want to receive newletters anymore, let us know.